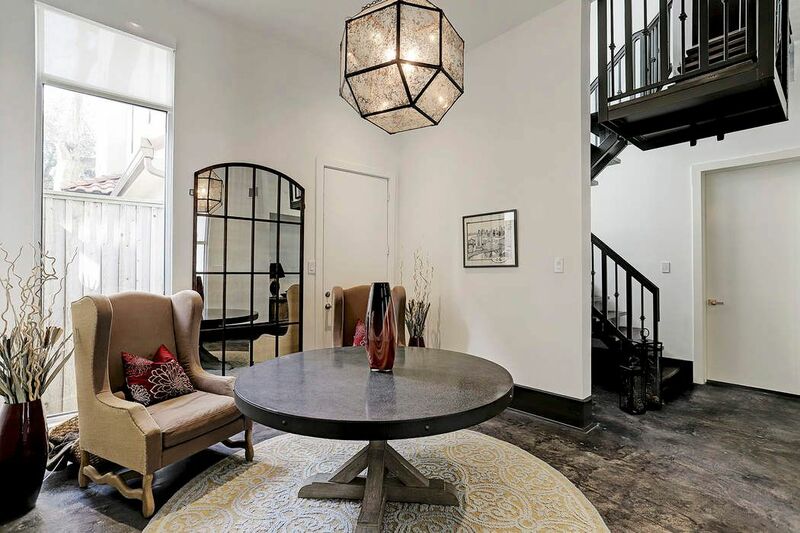 4118 Floyd Street Unit B, Houston, TX 77007 | Martha Turner Sotheby's International Realty, Inc. 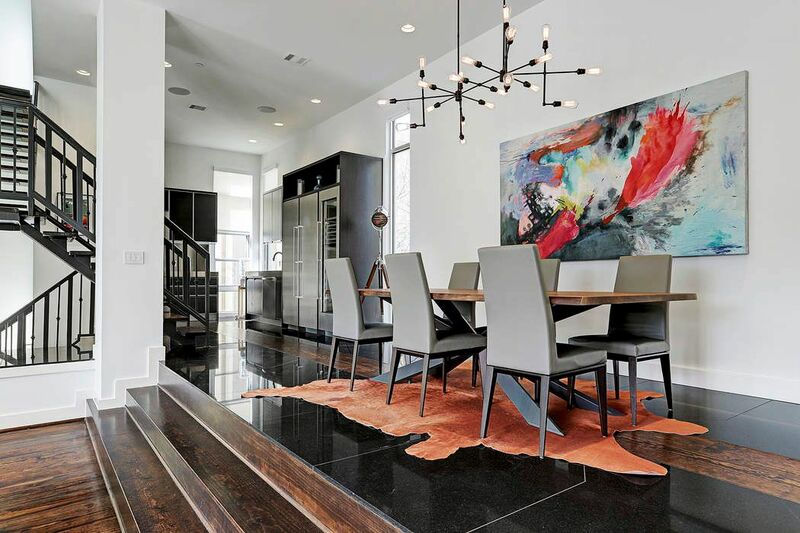 Striking 3 bedroom, 3 1/2 bath modern residence in the heart of Rice Military. 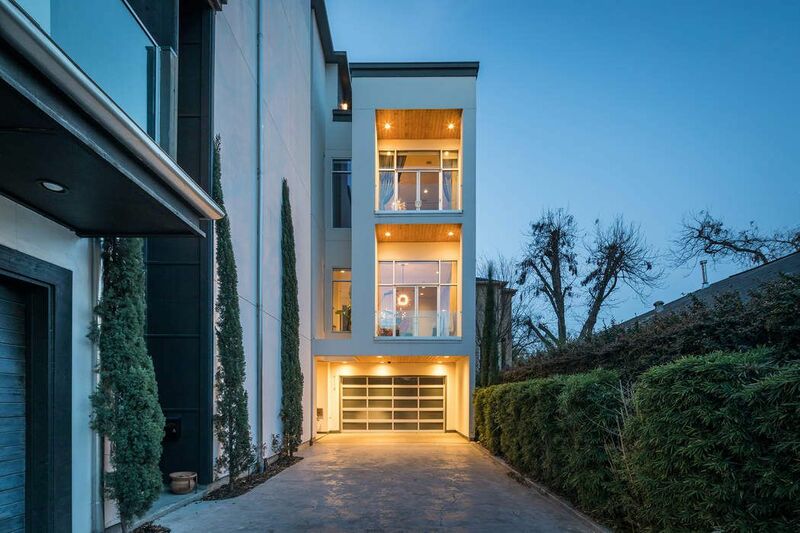 This home boasts a grand rooftop deck and a plethora of amenities. Concealed in the front entry, the security camera is perfect for an added touch of protection. 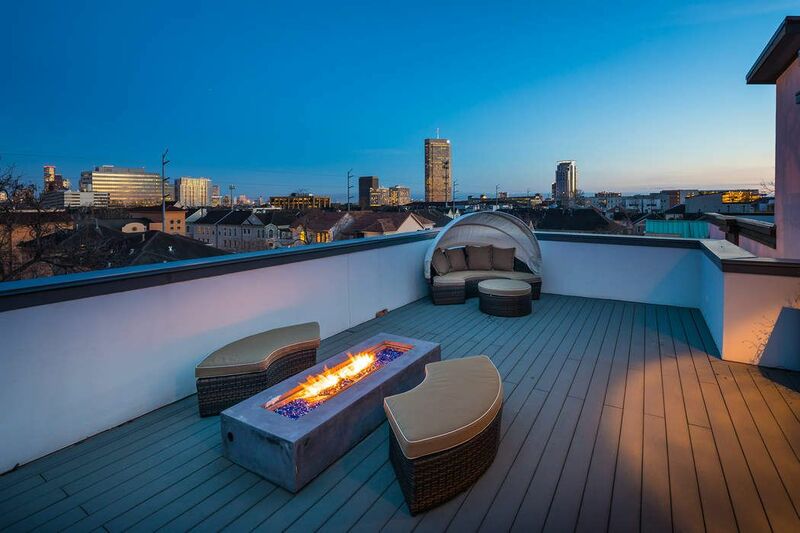 Take in a view of Downtown Houston from the rooftop terrace and enjoy an evening under the stars with friends and family. 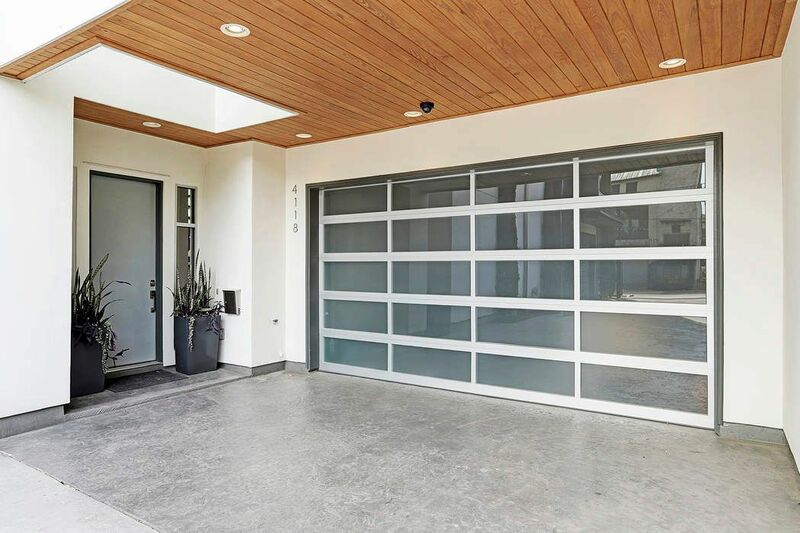 As you cross the threshold of the home, the 14 x 12 foyer sets the stage with its stained concrete flooring and unique 10'' steel beam baseboards. 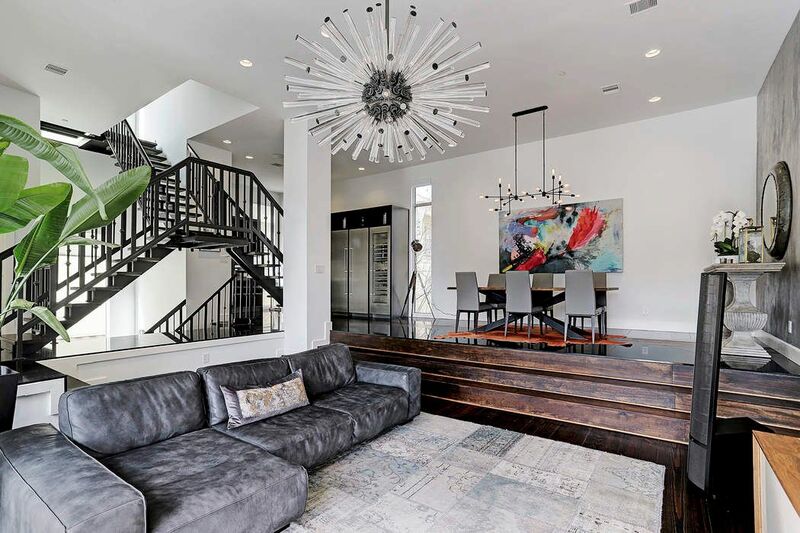 Astonishing custom steel staircase with and attractive chandelier. A large Restoration Hardware light fixture is the focal point of the foyer. 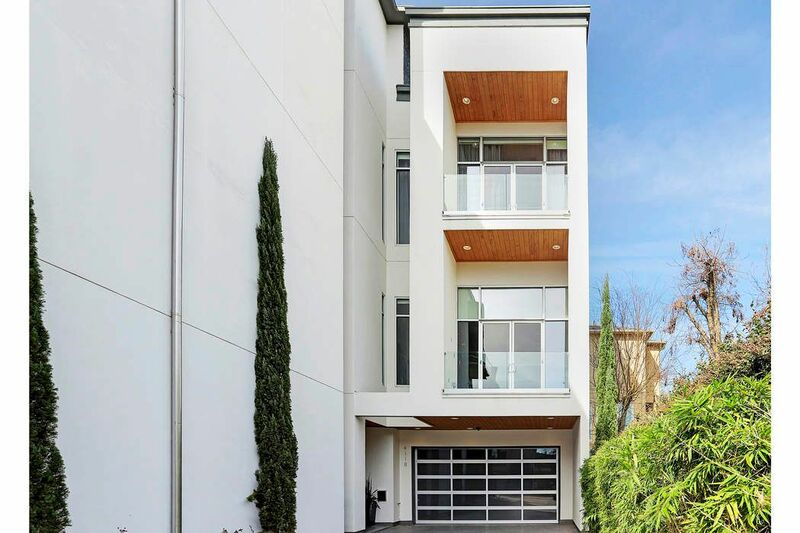 4118 Floyd #B features two 5-ton HVAC units on damper system, 2 tankless water heaters, fire sprinklers throughout house and solid wood 8' doors. 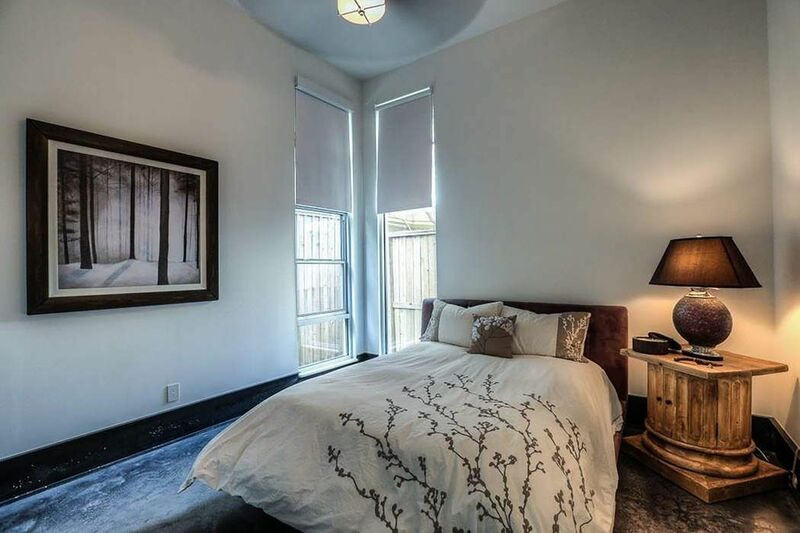 Measuring 13 x 12, the first floor secondary bedroom with full bath and large closet is complete with custom sunshades and a 4-blade ceiling fan. 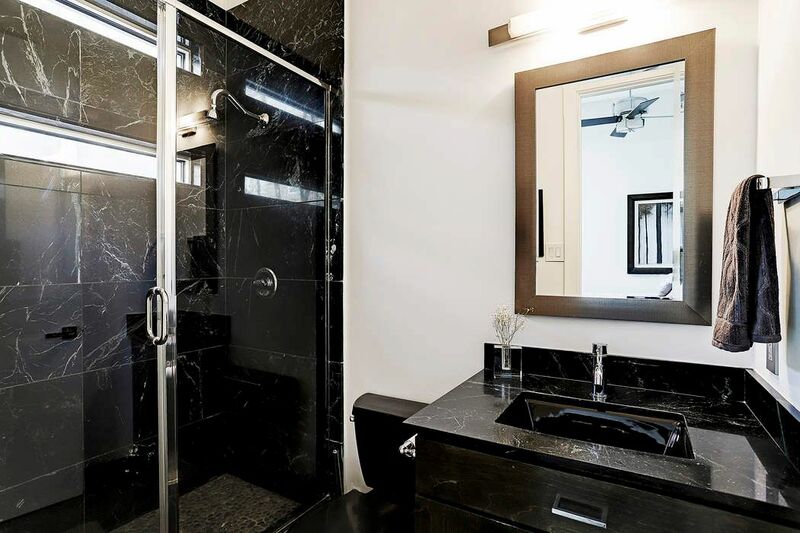 The en-suite bath for the first-floor bedroom features Black Galaxy granite counter tops, Delta fixtures and a shower with pebble rock flooring. As you make your way up to the second floor, the 18 x 12 living room features 11'' wide solid wood flooring. 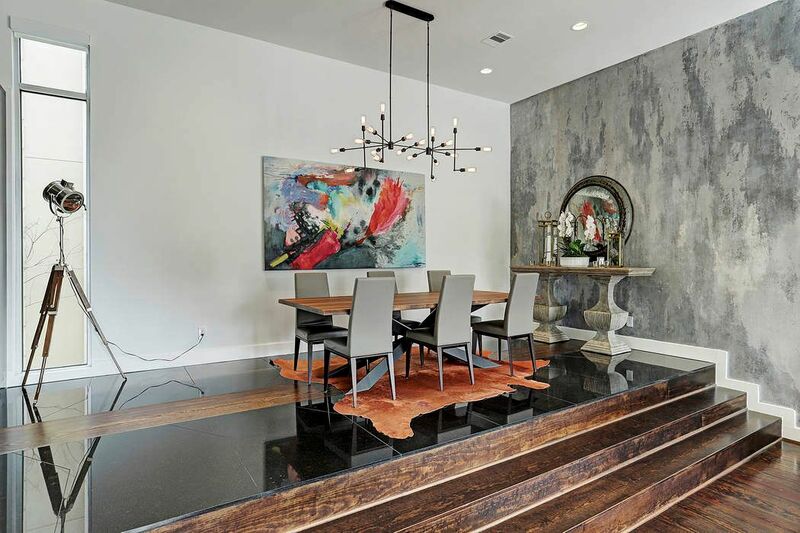 To the left of the frame is the dining area perfect for entertaining. 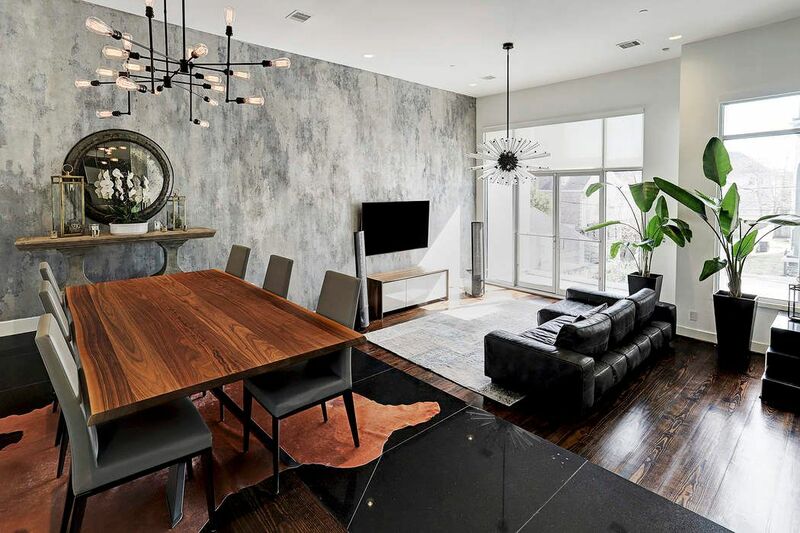 The open design impresses with the architecturally-cut Absolute Black slab flooring and globe clear glass light fixture with Edison light bulbs. What was once a closed off living and dining area, is now open throughout. The entire residence features a whole home surround system, speakers in every room and all LED can lights throughout. 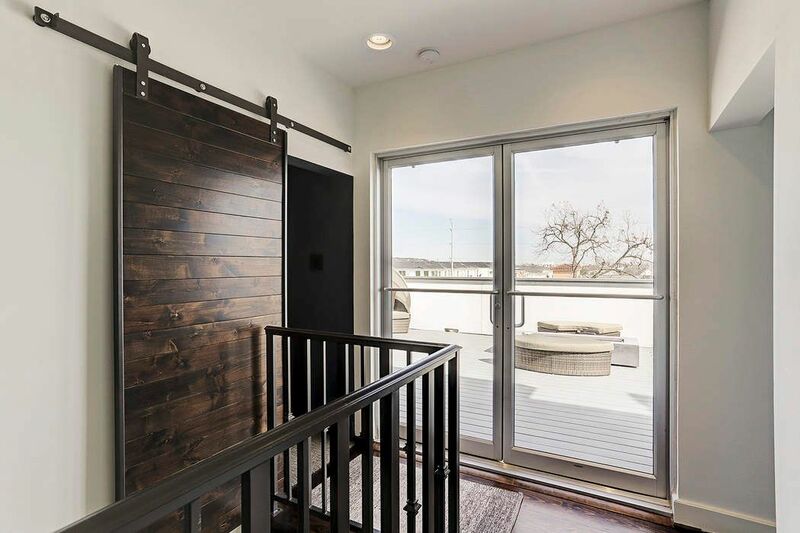 To the left, industrial grade doors lead out to the spacious balcony that offers south facing views. Off to the right is the kitchen. The soaring 14' ceilings and open floor plan provide a relaxed common living space. A custom finished wall take center stage of this grand room. This view of the 18 x 12 sunken living room as well as of the custom staircase. 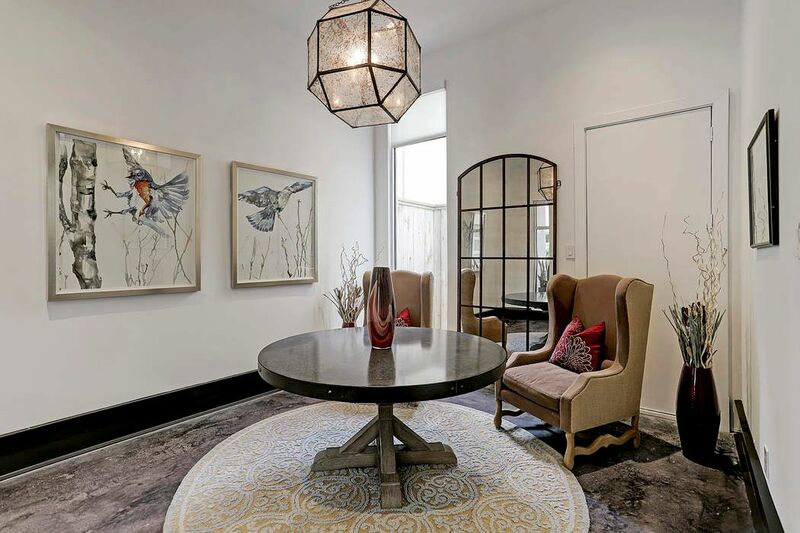 The sea urchin chandelier brings high fashion to the room. Take 3 steps up to the 15 x 13 dining room with well-designed space that you and your family will actually want to eat in. 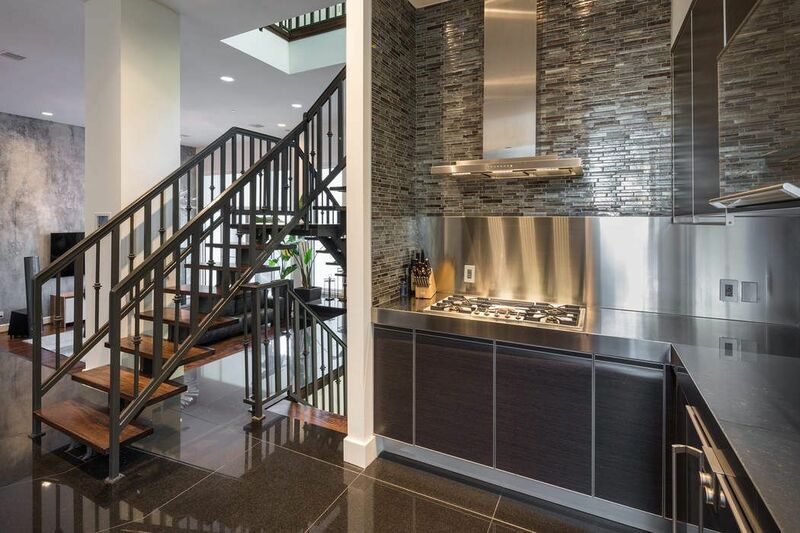 Note the high-end German style modern cabinetry in this kitchen. 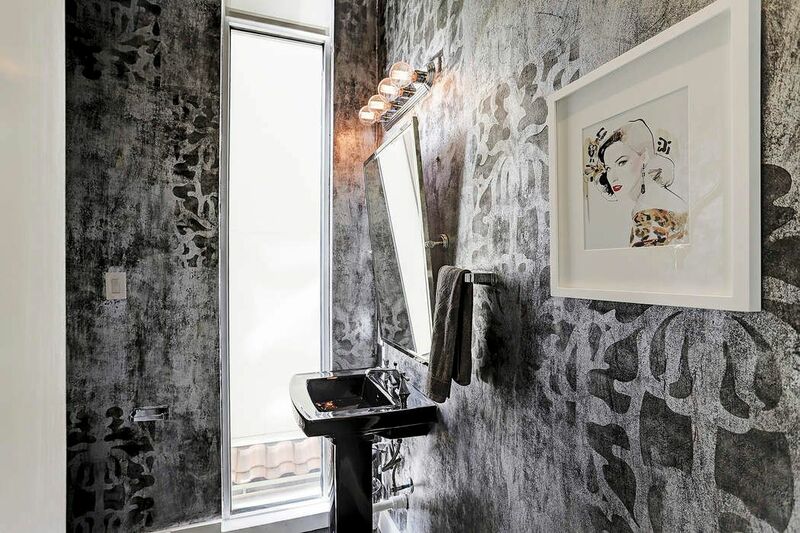 The attention to detail is prevailing throughout the home. 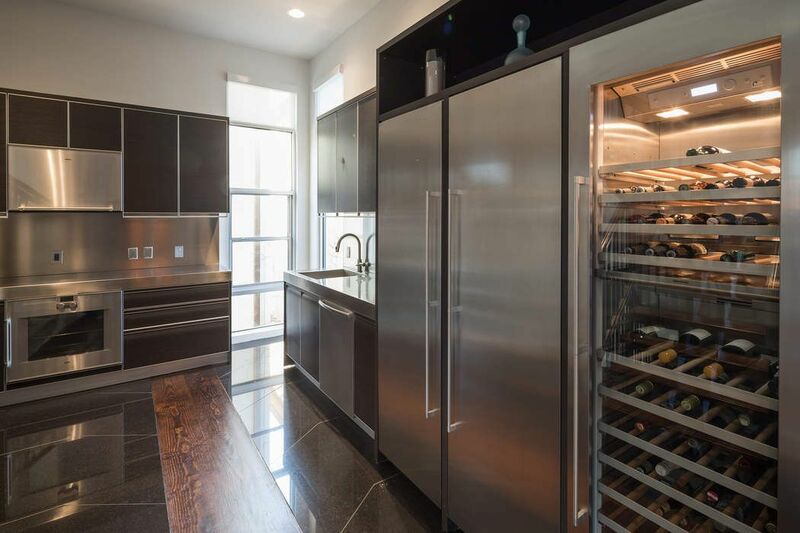 Capable of holding over 70+ bottles of your favorite wine, the built in wine cooler is perfectly placed between the kitchen and dining room. 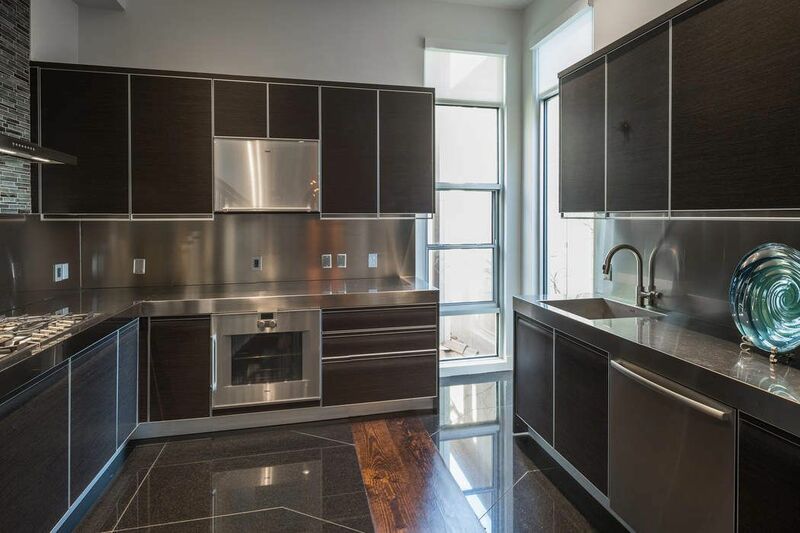 The 20 x 16 kitchen with built in stainless steel appliances and unique stainless steel countertops; a remarkably clean and stylish portrayal of contemporary. The 5-burner Gaggenau gas range anchors the open & inviting kitchen accented by sleek custom Del Tango built cabinetry with soft-closing hinges. 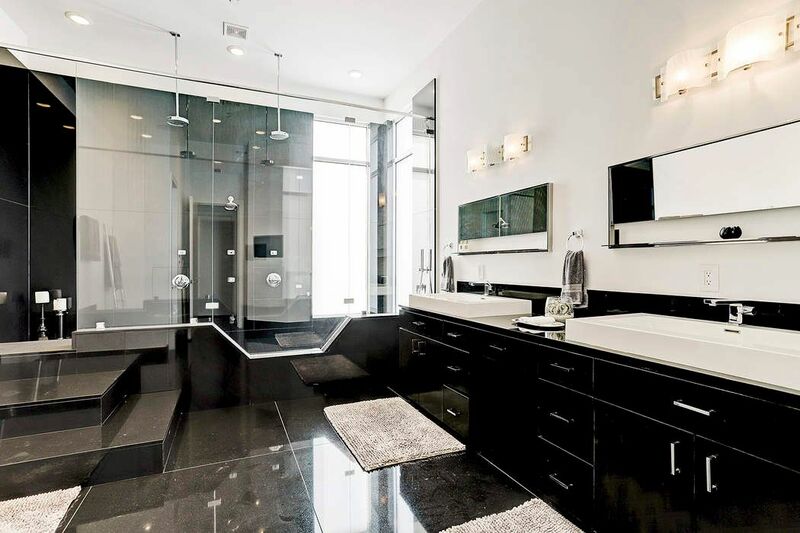 Immaculate master bath with contemporary rectangular dual sinks and Dornbracht fixtures. Not pictured is a custom flat television wall niche to enjoy the morning news while getting dressed. The dark Absolute Black granite counter tops give this bath an elegant look and contrasts well with the clean white custom dual sink. 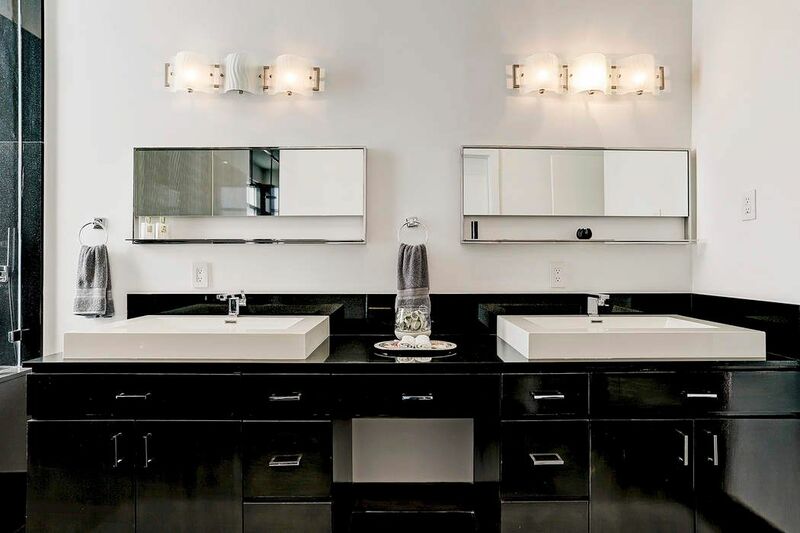 Designer light fixtures and private water closet complete this bath. 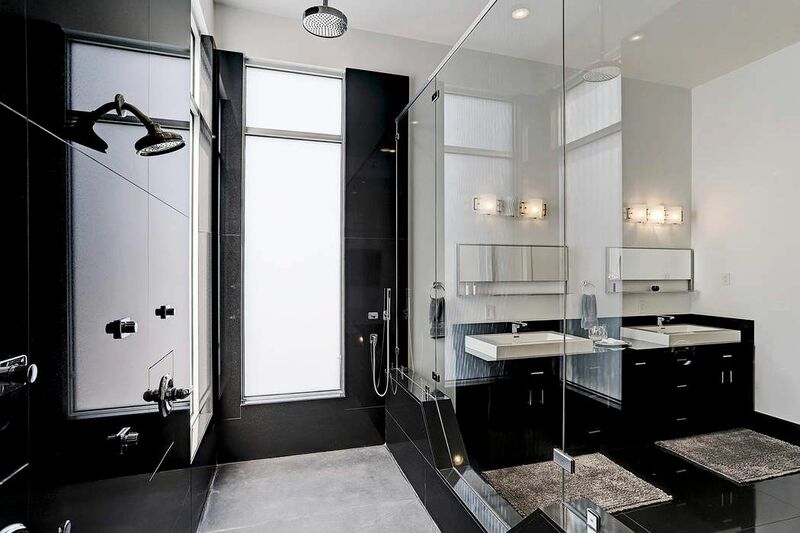 The immense seamless glass encased walk-in shower is a show stopper with its shower with granite surround and 3 shower heads, and handheld sprayer. 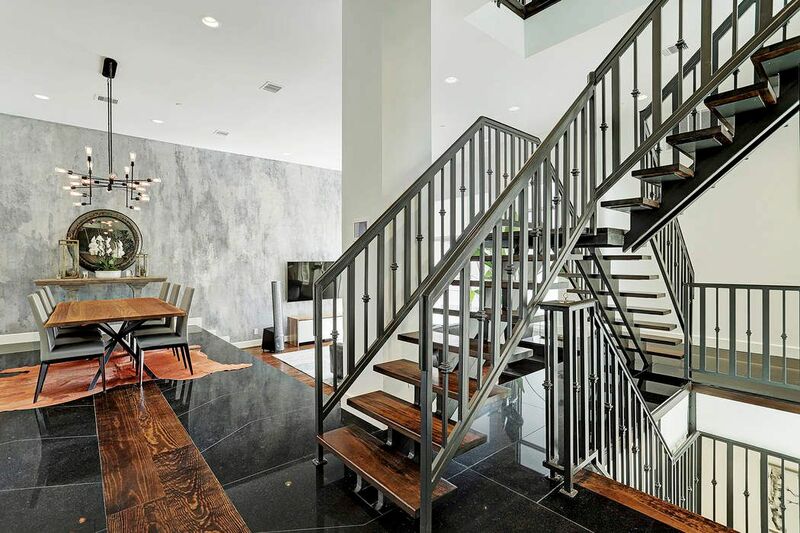 Situated on the 4th floor is the private theatre with custom barn door for additional privacy. On the left of the frame is a powder room that serves the home theatre and terrace. Indulge your craving for big-screen entertainment at home with the Epson PowerLite Home Cinema 8350. 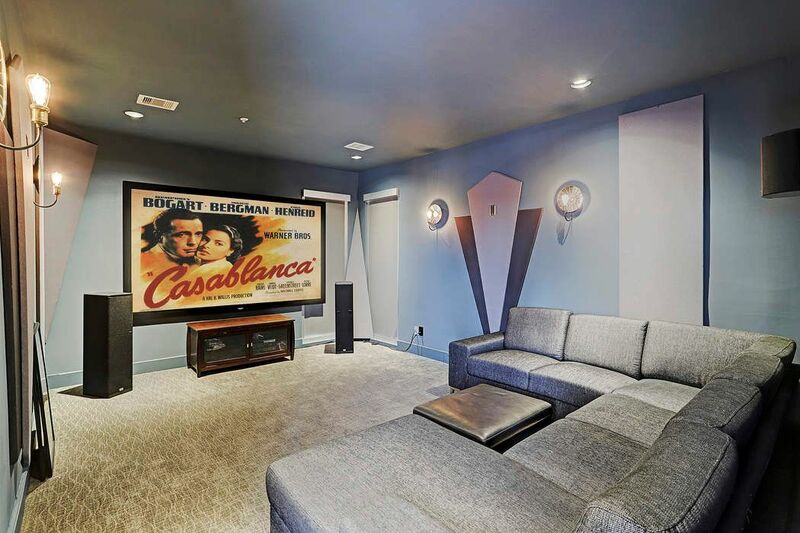 No need to wait in line at a crowded theatre with this home theatre system with Grandview screen and PSB speakers. 4th floor terrace is equipped with gas, water and electric as well as outside surround sound and cameras. 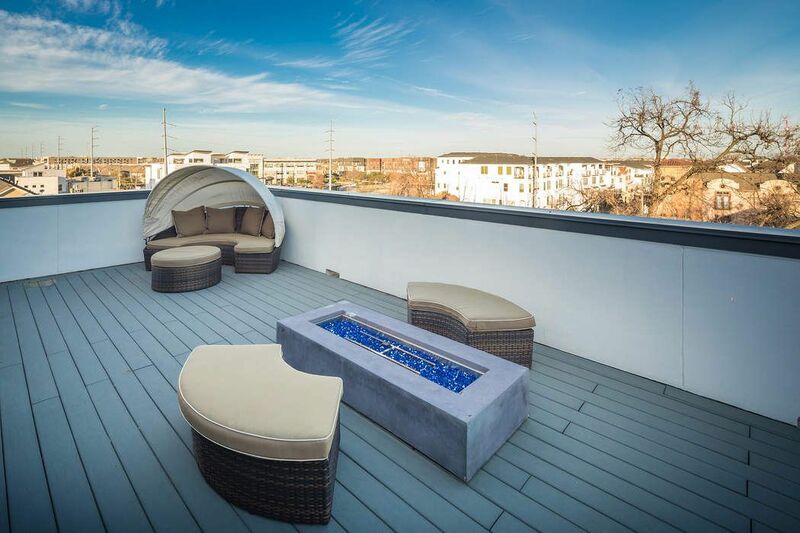 With over 550 square feet of additional outdoor space, this relaxing rooftop patio deck features a grilling area if desired and a large entertaining area. 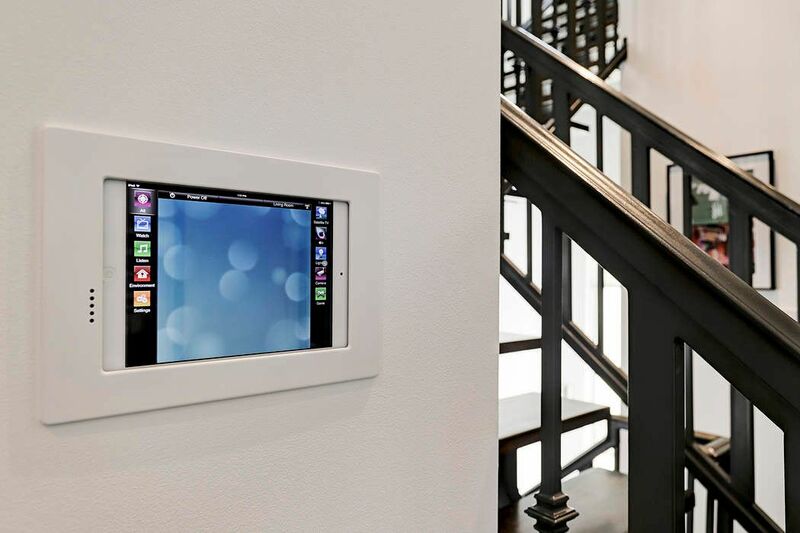 This luxury smart home features of Savant are now available with Amazon Alexa voice control. Customize the homes lights, music, video, shades, temperature and more at 4418 Floyd. $699,000 3 Bedrooms3 Full / 1 Partial Baths3,196 sq. 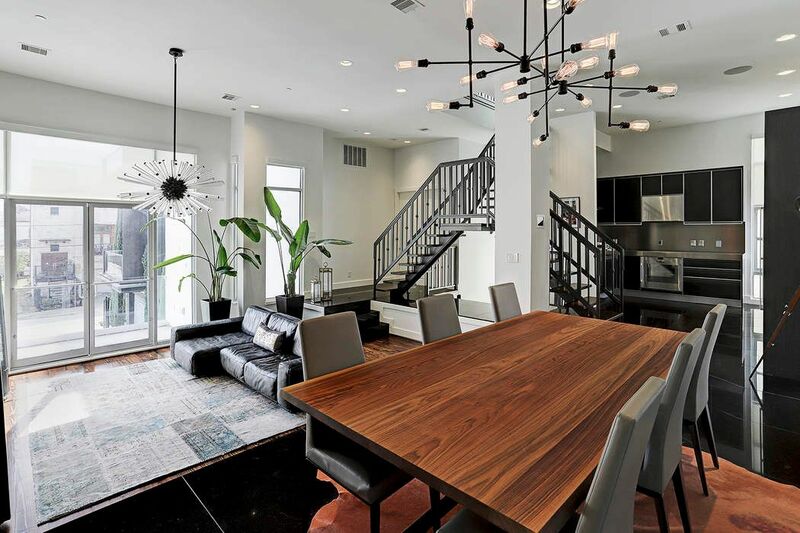 ft.
Just steps away from the Washington Corridor, this modern single family home is located near some of the most exclusive restaurants, bars and lounges in the city. 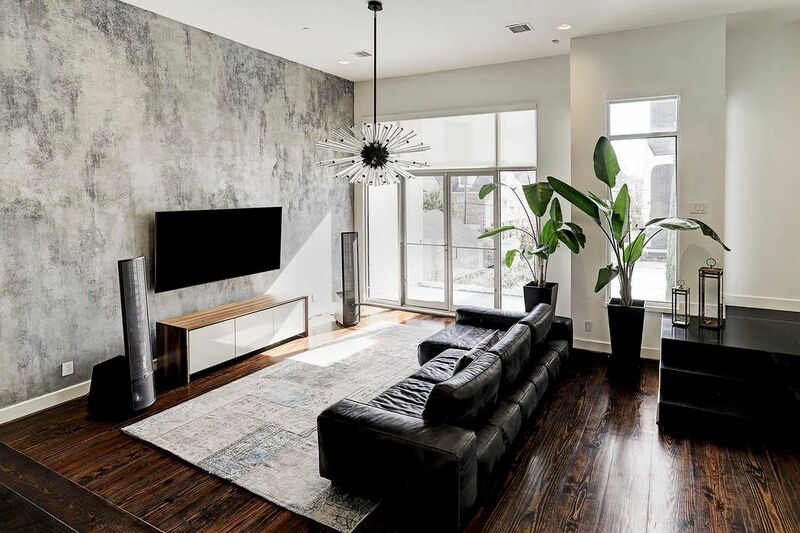 Featuring 3 bedrooms and a refreshing take on contemporary design, 4118 Floyd #B offers Gaggenau appliances and masterfully designed features such as voice-activated climate control, security, home surround sound and lighting with an Alexa enabled device. 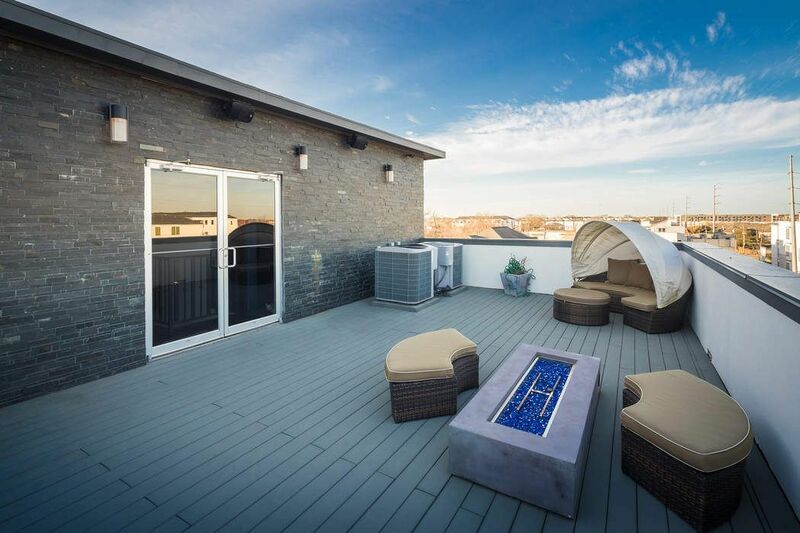 Featuring one of the best rooftop decks in the city, the outdoor space is equipped with a fire pit and outdoor gas plumbing to entertain. 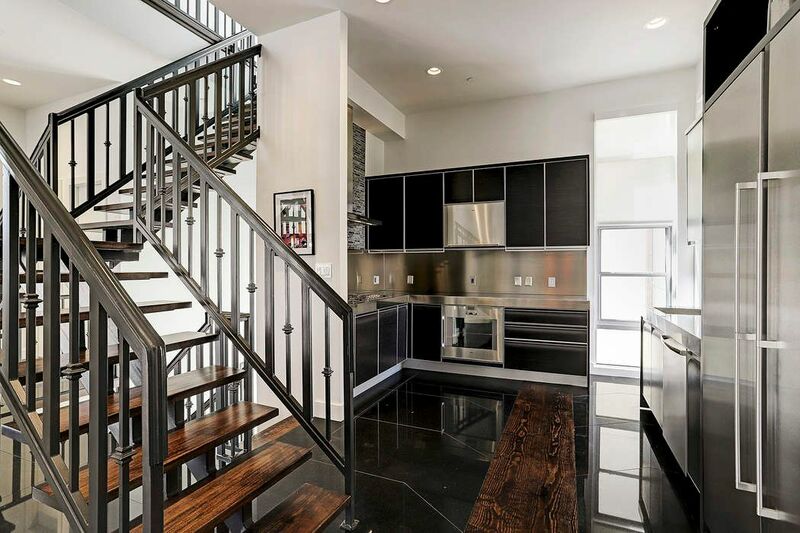 4118 Floyd #B is more than just a smart home…it’s a way of life.